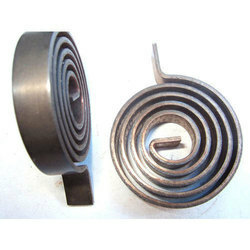 Offering you a complete choice of products which include spiral springs. We take pride in being the market leader in the engineering and manufacture of custom Spiral Springs. We can cut, bend, stamp in any size imaginable as required by our clients. Flat springs are parts that are generally stamped or laser-cut from a sheet of metal and are heat treated as necessary. Looking for Spiral Springs ?